I clicked on a 'Full Text Access' link in DISCOVER, but couldn’t get the full text. Why? ‘Full Text Access’ is a LinkSource service for providing links to the full text of e-resources found in DISCOVER. The Library has access to the full text of the article, but ‘Full Text Access’ cannot create a direct link to the article’s hosting site. After you click ‘Full Text Access’, you may go to ‘Publication Finder for Xi’an Jiaotong-Liverpool University’ (link on the top). Then the hosting site of the article will be shown, and you will be able to find the link to the full text. 2. We are not entitled to access the full text of the article. 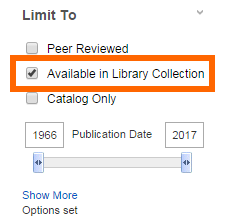 When you conduct searches in DISCOVER, make sure that you select ‘Available in Library Collection’. In this way, only those resources to which we have access will be retrieved. Sometimes, technical problem of linking or network error could cause the unavailability of the full text by clicking ‘Full Text Access’ link. If you still cannot access the full text, send the article information and your screenshots to askalibrarian@xjtlu.edu.cn.